Today we have the great pleasure to continue our pilot interview series and have asked Eva Claire Marseille, pilot on the Boeing 747-8 and the Boeing 747-400ERF in Hong Kong, a number of questions. Hope you will enjoy it as much as we did. My name is Eva, I am from The Netherlands. I am an airline pilot flying commercially for the last 6 years. I love aviation and I love traveling. I share my joy in being an airline pilot online on Instagram (www.instagram.com/flywitheva). This grew to a firm platform where I aim to inspire the new generation, especially girls, and people within and outside of aviation. No I was working to become a journalist. After high school I went to University to study Dutch literature and journalism; I got my bachelor degree in 2008. I felt a freelance journalist career would bring me what I wanted: a life of travel, living abroad, and meeting a lot of different people. In the end, this is what I now get from my career as an airline pilot. During my years at university I started to doubt my goal of becoming a journalist, and became interested in aviation. I decided to go for it, and that has been the best decision of my life. 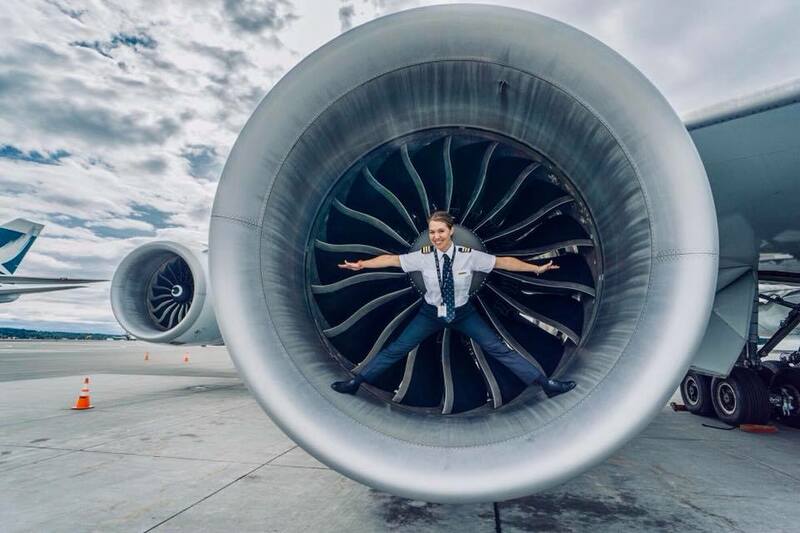 Tell us about your pilot career please! I studied an integrated ATPL course from 2008 to 2010. After graduating from flight school in 2010 the market was really bad for pilots, even experienced pilots were struggling to find a new position, let alone a 200 hour cadet like me. It took 2,5 years to get hired by an airline. In the meantime I worked in operations at Dutch airline Martinair as a dispatcher. I kept my license and medical valid, and invested in regular simulator training and courses (language, bush flying…) to improve my chances. When I got hired in 2013 to fly the Boeing 737-800 for a major European low cost passenger airline, this was a dream come true. I was based in Girona, Rome and Barcelona, and really enjoyed building jet experience. I worked here till the end of 2017: after 4 years I got a new job in Hong Kong, to fly cargo on the Boeing 747-8 and the Boeing 747-400ERF . You “upgraded” from Boeing 737 to 747. What are the biggest differences besides the obvious difference in size? The whole lifestyle is different: it meant changing from short/medium haul flights, to medium-long haul flights. From always sleeping in my own bed and never seeing anything from a destination as we would fly straight back, to layovers at destinations all over the world. From flying during the day to mostly flying at night. From a stable roster to a very unstable roster and coping with jetlags. From living in Europe to living in Asia. When you purely regard the airplanes, I would say it was a very doable step to change from a Boeing to a bigger Boeing. Honestly the 747 is simply the 737’s big sister. A lot of the systems and automation management are similar or even identical. It was more challenging to adapt to the new operating procedures of another airline, then to adapt to the new airplane. The 747 (especially the 747-8) does have a lot of ‘fancy’ features that make a pilots life easier compared to the 737, for example autostart, auto anti-ice, an airport map, automatic weather radar, and electronic checklists. And I now have a tiller on my side, so I also get to taxi the jet when it is my sector! As you are flying for a Cargo airline, you get to see a lot of airports off the beaten track. What is your favourite one and why? I do not fly for a cargo airline, but I do fly on the 747 cargo fleet indeed. My favourite airport is Anchorage in Alaska, as the approach and departure over the mountainous terrain are absolutely stunning, and it is a very social layover as there are always loads of my cargo flying colleagues around. What is the biggest difference for the flight deck crew flying passengers or cargo? I would say flying cargo is more relaxed. There is no stress in case of ATC or technical delays to explain to the passengers: boxes are very patient, and seem always content …haha! I don’t miss flying with disruptive passengers: some people really gave our cabin crew a hard time. That brings me to another difference: we don’t have cabin crew on board. The crew consists of 2 pilots, and on longer flights 3 or 4. That’s it! Flying cargo I really enjoy the freedom to leave the flight deck whenever we want, as there is not even a flight deck door. On the passenger flights we had to coordinate getting out of the flight deck, for example to use the washroom, with the cabin crew. It was quite a procedure (all passengers needed to sit and wear their seatbelt, and I felt we always interrupted the cabin crew with their duties. I would feel bad ‘bothering’ them and stayed for long time in the flight deck without stretching my legs etc. ), I don’t miss that! We now get up whenever we want to make food, use the washroom, stretch our legs, get another coffee etc. Do you still like to fly in your free time (both as a pilot or as a passenger)? I am completely in love with the Boeing 747 and truely enjoy going to work. But I don’t fly anymore in my free time. I feel general aviation is costly and I don’t feel so safe in crowded class G airspace, my single engine rating expired some years ago. I love to travel, but I don’t particularly enjoy flying as a passenger, I am always happy when we arrive at the destination! Is it tough for you to work in a male dominated environment? The short answer would be no. I absolutely love working with men and get along really well with a lot of my male colleagues. You don’t have to be ‘one of the guys’ at all, I never felt I needed to adjust my behaviour or act more masculine. I also never felt that my gender gave me extra pressure or that I am judged differently on my performance. You have to meet certain professional standards, and they are the same for men and women. I actually never gave it much thought when I applied at a flight school 10 years ago, that the aviation industry is really male dominated. That said: because we are still such a minority in the industry, it does not occur to a lot of girls that a pilot career is also an option for them. 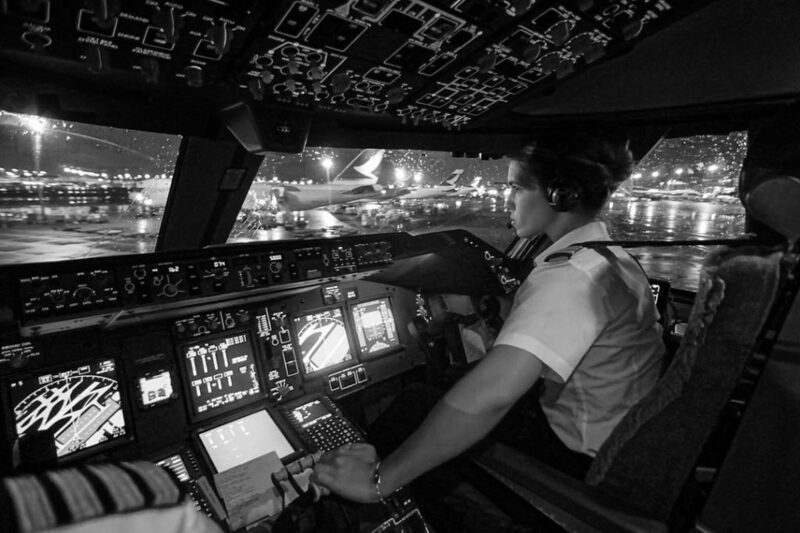 Although female pilots are no longer pioneers in the industry, it is still seen as a mens profession. When I tell I work for an airline, without exception people guess I am a flight attendant, or perhaps office staff. The looks I sometimes get when I tell I operate the jumbo, it seems some people can hardly grasp it. 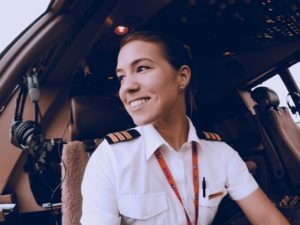 I aim to inspire the next generation of women to consider a career as a pilot, by showing my life and work on social media, giving interviews and writing about my journey on my blog. I would love it if more women would become pilots! Not because I feel the aviation industry would be better if the percentage of female pilots (currently 4%) went up, but simply because it is the best job I can think of, and I’d like more women to enjoy it. I mentor quite a few girls through social media, so don’t hesitate to reach out to me! Many thanks for this interesting interview, Eva. Make sure to check Eva’s Instagram (www.instagram.com/flywitheva) and blog (www.flywitheva.com). 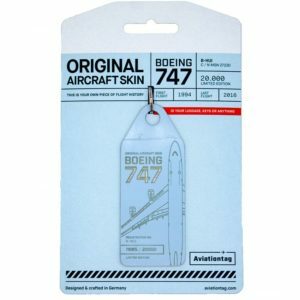 Get your B747 Aviationtag now! Posted in Aviationtag, Background, Boeing and tagged 747, aircraft, aviationtag, interview, pilot.